Solut line of take and bake pizza trays offers an attractive, cost-effective, and functional means of merchandising, transporting, cooking, and serving take and bake pizzas. 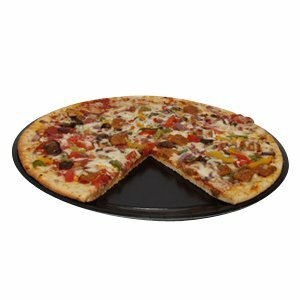 The take and bake pizza trays utilize heavy gauge SBS paperboard with a thin, extruded PET layer to provide a high-gloss finish and cut-resistant surface formed to provide an excellent value for take and bake pizzas. Solut pizza trays are perfect for bake and ship pizzas, and ideal for use in either microwaves or conventional ovens. Safe for cooking or reheating in microwave and conventional ovens. Excellent value, an economical alternative to conventional pizza boxes. If you have any questions about this product by SOLUT!, contact us by completing and submitting the form below. If you are looking for a specif part number, please include it with your message.